Twitter Photo. 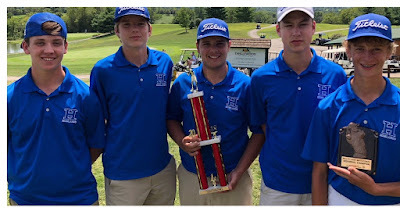 The Highlands Boys Golf team finished third in the Northern Kentucky Tournament on Sunday. Sophomore Justin Gabbard took medalist honors shooting a 69. The Blue and White shot for a third tournament championship in three days. 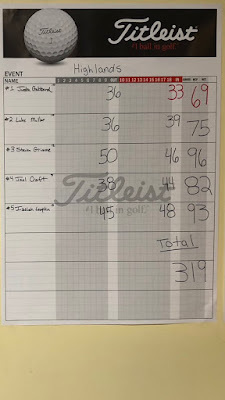 But the Highlands Bluebirds boys golf team fell five strokes short of it. Highlands shot a 319 in the Northern Kentucky Tournament at the Northern Kentucky Golf Course in Butler on Sunday. 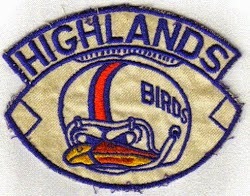 Highlands Twitter Photo. The Highlands girls golf team participated in the Walton-Verona Birdie Bash on Saturday. Freshman KJ Toole took third overall shooting an 85 in the 18-hole tournament out of 50 golfers. 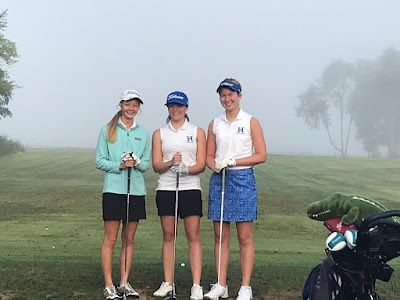 The Highlands Bluebirds boys and girls golf teams ventured to Warsaw on Saturday for the Birdie Bash Tournament hosted by Walton-Verona. The Highlands boys won their second tournament in two days while the girls had three compete individually. Four golfers are needed to form a team.